Savannah Lathem born on November 25, 1997 in Homewood, Alabama. Savannah has been acting in TV and Film since 2009. Savannah’s most recent film, California Solo made it’s World Premiere at the 2012 Sundance Film Festival and received raved reviews. The film stars Robert Carlyle (Stargate Universe). Savannah plays the role of Arianwen, the daughter of Robert Carlyle and Kathleen Wilhoite. Like many determined young actress’, Savannah has another project in the works. She just recently wrapped a lead role in the thriller feature film "The Guest House" opposite Daniel Baldwin and Eileen Davidson. Savannah has also gained interest in other avenues of the entertainment world including fashion. Her past work includes modeling for popular brands such as “Vera Bradley”, “J Brand Jeans”, “Ralph Lauren” and more. Savannah's past film credits include supporting roles in "Moneyball” and “The Stepfather”. Savannah’s past TV credits include playing Young Rachel on "LOST" as well as guest starring roles on "Criminal Minds", "Castle" and "Private Practice". Savannah Lathem: What drives me in life is using the gifts I am blessed with to make a difference in my life and those around me. Gilles Nuytens: What actresses have influenced you so far and why? Any favorite actress? Savannah Lathem: The actresses who have influenced me the most are Sally Field & Angelina Jolie. Sally Field is a multi talented Actress who is able to take any character and totally transition to become that character on every level. Angelina Jolie is an incredible actress and I love her role in Girl Interrupted and so many other films. I also love that she is an Ambassador and helps so many people. They have both inspired me as a young actress in developing character roles & I hope to meet and work with them some day. It would truly be an honor. Gilles Nuytens: What do you like the most about your job? Savannah Lathem: What I like most about working on set is that everyone is so kind, professional and fun to work with. I love that everyone on set is so glad to be there, especially me. Gilles Nuytens: Acting is quite a little like a virus, once you start, you can't stop anymore... but if you had to do something else in the future (studies or job), what would you like to do? Savannah Lathem: I plan to continue Acting and Modeling. I also plan to incorporate Fashion Design with my acting career and would like to design a clothing line like Mary Kate & Ashley, Selena Gomez and other stars have done successfully. I have already invented several designs that do not exist yet, and I look forward to getting started with this in the future. 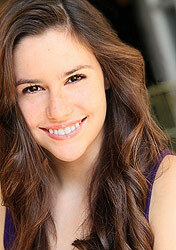 Savannah Lathem: I study with some very great coaches and prepare in advance before going on set so I am prepared. I am also always open to change and taking direction that might come along that the Producers and Director may have for my role. Savannah Lathem: I have been top choice for several feature films and TV shows this past year and I learned to stay encouraged and never give up on my dreams in Acting no matter what because it truly is what I want to do with my life and I getting callbacks, producer sessions and coming really close to more bookings. Gilles Nuytens: Leaving a set should be a little sad. Usually, do you still have contacts with people you met on the different sets you have been? Savannah Lathem: The last day is always hard to leave everyone, but also wonderful because everyone has worked so hard and spent so much time working together to accomplish such a wonderful moment on film. I have been very fortunate to still keep in touch with a lot of people I have worked with. Occasionally, different people call or I run in to people I have worked with from time to time and that is always fun to see them. Everyone is on such different levels in the acting industry so it is hard to see them all the time. 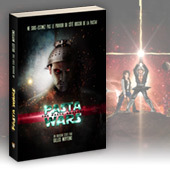 Gilles Nuytens: Well, let's talk a little about sci-fi, as we are a scifi site! What's your point of view on scifi in general? Savannah Lathem: I love Sci Fi and would love to have an opportunity to work on a Sci Fi Project. Savannah Lathem: I love roles that are remembered long after the movie or TV show is over. I love films that are quoted by people years after they have been shown. I would have to say I prefer to play one that has most marked me. Gilles Nuytens: What are the best memories you have from The Guest House? Savannah Lathem: The best memories I have filming The Guest House was a moment during an Attack scene in the RV when the Stalker tried to attack my Dad (while it was rolling down hill). I love challenging roles and I love doing my own stunt work. I had special on set training on how to use a knife. My two older brothers also taught me how to use a knife, fight, and shoot a gun so it made it so much easier for me when I learned on set. Gilles Nuytens: What are the best memories you have from California Solo? Savannah Lathem: The best memories I have working on set of California Solo was working with Robert Carlyle. He is one of the most amazing actors I have ever met. He made it so easy for me to slip into my character and he taught me so much about subtext. Off set he showed me pictures of his character, Rumpelstiltskin, on Once Upon A Time and talked to me about the simply things in life. I loved that He is not full of himself. He is a very humble person. That is a memory I made a mental note of that I treasure. Robert Carlyle is someone I look up to as a role model both on and off set. Savannah Lathem: I am currently in top consideration for a feature film project. I have been very fortunate to be in consideration for several TV and Film projects in 2012 and look forward to 2013. I have several Print Ads coming out this year for Mystery House (Party City), and a few other Big Projects to be announced soon. and I currently model and advertise for Vera Bradley, New York Dress and I am a Blogger for NewYorkDress.com. Savannah Lathem: You guys are great and I appreciate you taking the time to interview me.